The bathroom is a place we all love (maybe except for small children who hate cleaning their teeth). The bathroom means a rest or contrariwise, a boost. Moreover, it is ideal in the way you can remodel it easily following a few steps. 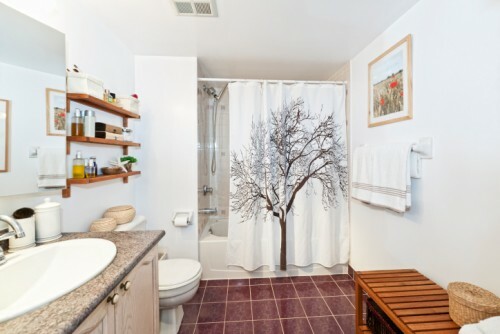 People living in a rental apartment know it especially: the bathroom often looks plain and unattractive. The best thing would be to remove the tiles completely and to organize the room in a different way – but it is obviously impossible. Anyway, you need not to despair, a small facelift can be acomplished even in an afternoon and a single tile need not to be sacrified. In the beginning of a mew year, we like to look back and around to consider, what can be changed and improved in our lives. Sometimes it results in imposing life plans and sometimes it just means a need to throw the old faded towels away. It is logical indeed, the towels actually contribute to the appearance of the bathroom like hardly anything else. They are constantly lying on the shelves, drying on the pipes or on the heating, hanging next to the sink … They are actually everywhere. In the new year, let’s make a resolution to get rid of everything that has its best behind, or that´s colour does not suit to your bathroom. Do you have a deep green towel that have moved with you through the three previous apartments? Maybe it is the right time to cut it into cloths or discard it in the textile container. If you can replace the bathroom mirror in your apartment, take it a huge advantage. The mirrors can make wonders with the space and the bathroom is the only room wherein they look natural as we are all accustomed to the bathroom mirrors. 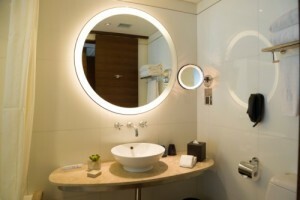 The bathroom mirror is determined to be a significant unique feature of the bathroom. It can have an unusual frame or shape or you can invest a little more and experiment with the illumination. The next easy trick is making use of large surfices which can be quickly changed aesthetically. What does this mean in practice? It means primarily a shower curtain or a shower screen, which are meant to be exposed (to change the whole mood of the bathroom) or hidden as you like. The bathroom curtains are quite cheap today so you can have a few to change them as needed. For example, one of them can look luxurious (popular are heavy fabric curtains with a water-repellent inner side), while the other funny. If for you do not want to start a bathroom renovation for any reason, be careful to work really with colour base you are given. Most of the Czech bathrooms surprisingly do not use the pure white tiles but the colorful ones, mostly in marble decor and warm tones. Such a base should be ideally completed with neutral accessories in shades of white and cream white because these shades do not contrast with the tiles but complement the atmosphere of the bathroom lined with the stone imitation. In the case your bathroom is exceptional and is lined with the white tiles, you can afford colour experiments. What Makes Sitting In The Living Room Perfect?